Mumbai: Marking the end of a 28-year strategic alliance in courier operations, DHL Express, the Bonn, Germany-based courier and logistics major, has parted ways with its Indian master franchisee, AFL Pvt. Ltd, which, in turn, is now eyeing a deal with Georgia, US-based United Parcel Service Inc., or UPS. Effective 1 January, DHL will use air express and transportation company Blue Dart Express Ltd, in which DHL Express has an 81.03% stake. A senior AFL executive, who did not wish to be identified, confirmed the developments, including the potential UPS tie-up. AFL chairman and managing director Cyrus Guzder couldn’t immediately be reached for comment. “I will not comment on these market speculations," said Pirojshaw Sarkari, managing director for the Indian subcontinent at UPS. India’s courier industry is valued at about Rs7,100 crore annually and is estimated to have grown by about 33% each year for a decade, according to leading research firm Credit Analysis & Research Ltd. Since 1979, AFL, controlled by entreprenuer Guzder, has handled shipments and parcels in India for DHL through a sales and service agreement, except in 12 cities where DHL was present on its own. Founded in 1945 when Guzder was appointed by Tata Airlines (now Air India) as its first sole cargo agent in the country, AFL introduced India to the concept of express delivery (courier services) through an exclusive alliance with DHL Worldwide Express in 1979. Later, AFL launched its domestic courier service, called AFL WiZ in 2001. Amid a booming economy, international courier firms are increasingly planning to enter India either through acquisition or joint ventures. Reliance Capital Ltd, part of the Reliance-Anil Dhirubhai Ambani Group, had acquired a 44% stake in Bangalore-based courier and express company DTDC Ltd in mid-February. Meanwhile, India’s second largest courier company, First Flight Couriers Ltd, recently secured an investment from Singapore-based investment firm Temasek Holdings. FedEx Corp., the world’s largest express transportation firm, acquired Prakash Air Freight Pvt. Ltd, or PAFEX, for $30 million (Rs135 crore then) in November 2006. PAFEX was operating as a franchisee for FedEx for the last 22 years. This acquisition enabled FedEx direct entry into the domestic express market. Netherlands-based TNT NV has acquired Secunderabad-based road express company Speedage Express Cargo Services, a unit of transportation company Associated Road Carriers India. After first entering into a sales alliance with Blue Dart Express in 2002, DHL acquired a majority stake in it. “DHL Express has a long and mutually beneficial relationship with AFL in India," said Chandrasekhar Pitre, head of marketing of DHL Express India. 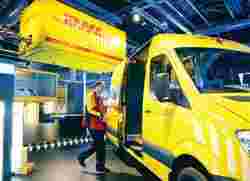 “(But) over the years, DHL Express has (also) made significant investments in India in new technology, infrastructure, innovative products and services, besides forging strategic alliances to expand our footprint in the country, beyond metros." “With Blue Dart, we will further improve our service quality and build our network in upcountry locations," Pitre said. “We do not believe this development (end of agreement with AFL) will impact DHL’s business, coverage or service in any way." It is unclear what impact the ending of the DHL relationship will have on AFL, though it could be offset by any future relationship with UPS. The Indian courier industry is highly fragmented, with more than 2,500 operators. However, a few large players account for more than half of the industry’s revenue.